You’ve all seen the movie “Julie and Julia”, a wonderful film starring Meryl Streep as Julia Child. Now, you’ve got to read the book by Julie Powell. It starts out terribly with the worst writing you can imagine, then it hits its stride and knocks it out of the park. You know how the book is always better than the movie? Trust me! It’s laugh out loud hysterical. What do you associate with French cooking and Julia Child? Does ‘butter‘ come to mind? 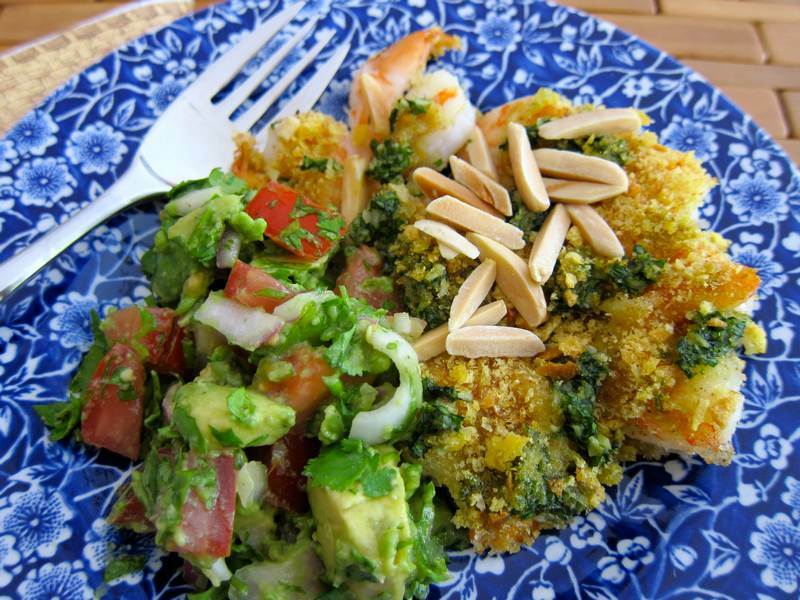 I tried this version of Shrimp DeJonghe at a pot luck dinner and swooned. The aroma is 100% escargot – nothing smells butter and garlic like escargot. Feed me cardboard smothered in butter and garlic; I’ll ask for seconds. This dish will impress the hell out of anyone you care to impress the hell out of. Blanch shrimp in boiling water for just 30 seconds — do not over cook. Drain and rinse under cold water immediately, until cool. 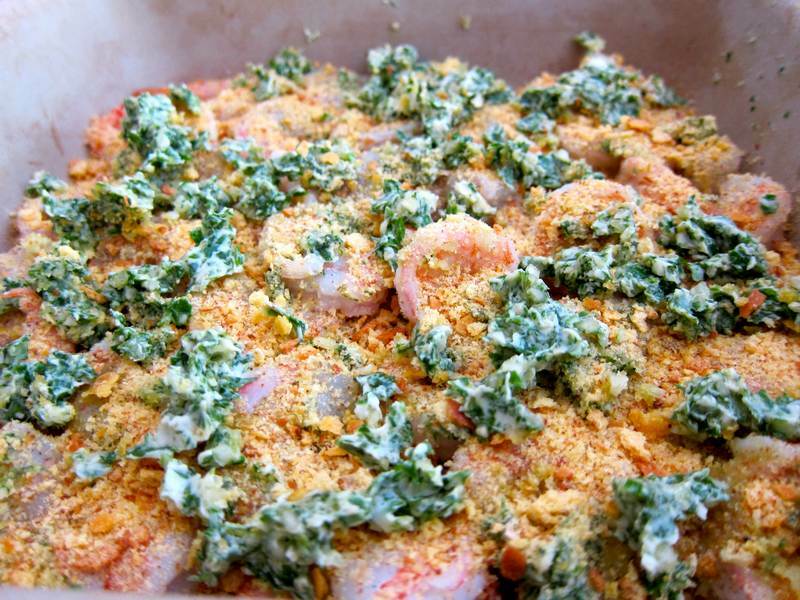 Pat dry and arrange in one layer in a 9-inch square baking dish. Add salt and pepper to taste. Mince and mash garlic to a paste with a pinch of salt. Stir together with butter, parsley and sherry until blended. Stir crumbs into the butter at the last-minute, just before you put it into the oven, so that the crumbs remained somewhat crunchy. Dot shrimp with crumb mixture and sprinkle with almonds. Pre-heat oven to 400 degrees. Cook the shrimp dish for about 15 minutes until the topping is lightly browned. Serve with lemon wedges. This recipe comes from DeJonghe’s Restaurant in Chicago. I was told that it was published in The Gourmet Cookbook. Thanks so much to bookclub buddies Gail Cornell for sharing the recipe and Carolyn Ward for preparing it so splendidly. You are both entered in the next Jittery Cook draw! If you are looking for a dish to go with the Shrimp DeJonghe, check out the latest Jittery Cook post–Lentil and Rice Pilaf with Caramelized Onion.